Hot on the heels of Electrocompaniet's cheaper PC-1 CD player, the ECC-1 is the basic CD-spinner from the company's 'Classic' line. It's an unusually large machine and very heavy too, mostly due to the use of thick steel for the casing, though the generous toroidal transformer will add a bit, too. The front panel is a piece of polished acrylic sheet, with the CD drawer in the centre. 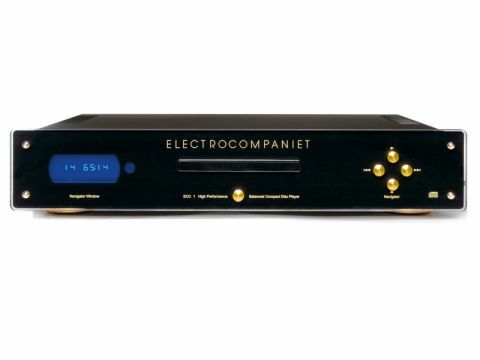 The characteristic Electrocompaniet four-button control set is at the right, the buttons themselves attractively made of solid brass. The machine itself may be very attractive to behold, but we reckon the ergonomics could do with some improvement. For a start, even by current standards, it's terribly slow to load a disc. Via front panel or remote, one must press and hold the 'Stop' button to open the drawer and even after the display has acknowledged this you still have to wait a few seconds. Reading a new CD also takes a while and the player then unavoidably goes on directly to play track one. It is impossible to start playing with any track other than the first one. Seeking within a track is only possible from the remote and only at a pitifully slow speed. CD ergonomics have never been great, but this is, at times, frustrating. Electrocompaniet has been more original than most internally. The sample-rate converter chip for digital filtering and the DAC itself, are familar parts of recent vintage, but the analogue stages are evidently all in-house and use discrete transistors instead of the more common integrated circuits. This includes the balanced output, which is not an afterthought – quite the reverse, in fact, as the phono sockets are wired to two pins of the XLR output connectors. A single digital output is available. Although nothing seemed overtly wrong with the sound of this player, our listeners were not entirely drawn into its music-making and expressed a variety of reservations regarding it. None of these were major, but the overall picture is of a sound that's just not quite completely rounded-out, especially as regards fine detail and insight. This became evident from the first track played, where one listener was concerned to find the timing unclear, while another thought the vocals and reed instruments were a little on the thin side. Things picked up a bit in the classical tracks, with more satisfying tonality and better timing – or could it just be that most classical music relies less critically on this aspect and so it is less obvious if it is slightly compromised? The large forces of Rachmaninov's Symphonic Dances were clearly differentiated in the lower parts of the spectrum, but comments were made indicating that a little more precision in the treble would have been welcome. Solo piano had plenty of body, but lacked a little refinement and had a slightly 'twangy' quality. In our sighted listening, after the panel had departed, we found that the real problem seems to be a slightly grainy quality in the high treble. Bass and midrange, on the odd occasions when they occur with little or no treble accompaniment, are very clear and well defined, but the treble grain makes itself felt across the range – we get a lot of information from the high treble and when that is frustrated, our ears react badly to the whole sound. It's a pity as it does compromise the performance of this player and conceals some good performance in areas such as midrange tonality and imaging. Maybe Electrocompaniet could score a double whammy by addressing that at the same time as the ergonomics?